Hello! Welcome to my home page! I have been teaching in the Nohad A. Toulan School of Urban Studies and Planning at Portland State University since 1994. In addition, I am Co-Director of the China-PSU Sustainable Planning Program and work with the Oregon Consensus Program in the National Policy Consensus Center in the Mark O. Hatfield School of Government. My primary areas of teaching and research are environmental planning, planning processes, and consensus-based decision making. Tuesday, 11:00 a.m. - 1:00 p.m. or by appointment. Work in the public sector requires reaching agreement with others about how this work should be and will be done. This course provides an overview of negotiations in the planning and policy making fields, theoretical rationale for how these negotiations might best occur, and opportunities for participants in the class to build negotiation skills. This is a highly participatory class and requires faithful attendance. 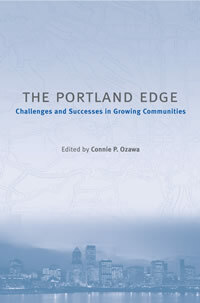 Edited book about the Portland, Oregon metropolitan region, its institutions and its people, written by faculty and graduates of the Toulan School of Urban Studies and Planning (Island Press, 2004). A revised edition in Chinese will be available in fall 2008, from Southeast University Press. Below: Biking along Chicago's lakeside, 2008. The China-PSU Sustainable Land Use Planning and Sustainable Urban Planning and Design training programs are conducted in partnership with the International Sustainable Development Foundation and China's Ministry of Land and Resources and Ministry of Construction. This program brings about 100 Chinese planners and policy makers to Portland each year in order to further our mutual understanding of sustainable urban systems. Conversely, each year, a delegation of university professors, practicing planners, real estate professionals and community members are invited to China to visit ongoing sustainability projects. These photos were taken on a tour of China in 2006. The photo to the right was taken at the ancient Hongcun Village. Below are photos of a shopping street in Shanghai (left) and a major boulevard in central Beijing (middle), and Huangshang Mountain (right).